Father Dresser was the fourth Rector of the Church of the Good Shepherd (1980-1995). The following information is from Father Dresser’s obituary. Robert Merrill Dresser born on February 13, 1931, died on February 27, 2015 in Newburgh, New York. Fr. Dresser took degrees at Yale University, Yale Divinity School, the University of Connecticut, and his PhD at Fordham University. He was ordained to the priesthood by Bishop Hall in 1956. Fr. Dresser served as Curate at All Saints, Worcester, MA, 1957-59; Rector, Bishop Seabury, Groton, CT, 1959-64; Rector, St. Francis, Stamford, CT, 1965-77; Rector, Christ Church, Rye, NY, 1977-78; Vicar, St. Mark’s, Chelsea, NY, 1978-80; Rector, Church of the Good Shepherd, Granite Springs, NY, 1980-95. Fr. Dresser in retirement served Christ Church, Marlboro, and St. George’s, Newburgh, and was an adjunct professor at Mount St. Mary College, Newburgh. 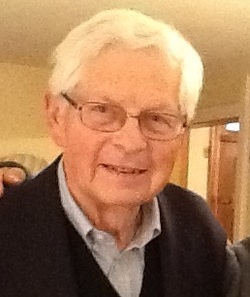 For over ten years he served as a Mentor to Education for Ministry. Fr. Dresser had a multifaceted mind that drew upon the Scriptures, the Early Church Fathers, the Spirituality of St. Francis, classical music and jazz, as well as contemporary film. He authored “Rhetoric and Substance in Bernard of Clairvaux”, “Sermons on the Song”, and “Studies in Medieval Cistercian History.” He was an Associate of the Society of St. John the Evangelist, Cambridge, MA. Fr. Dresser was the son of Allen Trafton Dresser and Mildred Louise of Belmont, MA. He is survived by his wife, the Rev. Deborah M. Dresser and his brother, John Allen Dresser of Westbrook, ME. He was predeceased by his former wife, Elizabeth B. Dresser and his sister, Connie Rooney. He has two daughters: Deborah Ann Greco and Sally Elizabeth O’Brien, and two stepdaughters: Suzanna Carter Francis Wlodarski and Margaret Francis Stromswold. Other members of the family include: Antonio Greco and two grandsons William Graham and Michael Anthony Greco; Tom O’Brien, and three grandchildren, Casey, Betsy and Charles O’Brien; Rafael Wlodarski and two granddaughters: Lulu Sophia and Eva Clementine Francis Wlodarski; Tedd Stromswold and one granddaughter, Katherine Carter Stromswold. The Requiem Mass will be celebrated at St. George’s Church on Wednesday, March 4, 2015 at 11 o’clock in the morning, the Rt. Rev. Andrew Dietsche, Bishop of New York presiding. There will be no calling hours. In lieu of flowers the family requests that donations be made to the American Friends of the Episcopal Diocese of Jerusalem, www.afedj.org. The following information is from Bishop Dietsche’s Letter to the Diocese of New York regarding Father Dresser’s death. With profound sorrow, I write to tell you of the death this past Friday of the Rev. Dr. Robert Merrill Dresser, who offered exceptional service to our diocese as a parish priest and educator, and to invite your prayers and presence at his funeral. Wednesday, March 4, 2015, 11:00 a.m.
Clergy: Only those participating in the liturgy shall vest. Bob was a true lover of scholarship and valued the place of education in Christian discipleship. Born in 1931, he took degrees at Yale University and Yale Divinity School, then was ordained to the priesthood in 1956 by Bp. Charles. F. Hall in the Episcopal Diocese of New Hampshire. He served parishes in Massachusetts and Connecticut before beginning his longstanding ministry in our diocese, as Rector, Christ Church, Rye, 1977-78; Vicar, St. Mark’s, Chelsea, 1978-80; and Rector, Church of the Good Shepherd, Granite Springs, 1980-95. In retirement, Bob offered ministry in Christ Church, Marlboro, and St. George’s, Newburgh. In 1980, Bob married the Rev. Deborah M. Dresser, also a priest of our diocese. In parish ministry, she has excelled in outreach and interfaith relations, and she has served as President of the Standing Committee. Currently, she is the interim priest at St. Paul’s, Chester. In 2008, Bp. Mark S. Sisk awarded her the Bishop’s Cross. For several years prior to my consecration as bishop, Bob and I enjoyed something of a shared ministry in pastoral oversight of Saint Mark’s Church in Chelsea-on-Hudson. I had known Bob and Deborah through their significant ministries of priestly leadership in the Hudson Valley, but the time Bob and I spent in care of Saint Mark’s brought us a true friendship and an intimacy in our common ministry. I have seen first-hand the lives Bob has touched, and the personal transformations which God has worked through Bob’s ministry. Truly, these mature, well-formed Christians are Bob’s legacy. Bob’s death comes unexpectedly, and we grieve with Deborah, his daughters Deborah Ann Greco and Sally Elizabeth O’Brien and stepdaughters Suzanna Carter Francis Wlodarski and Margaret Francis Stromswold, his brother John Allen Dresser, and an extended family that includes many grandchildren. Cards and expressions of condolence may be sent to Deborah and the family at her home: 12 Bay View Terrace, Newburgh, NY 12550. Donations in memory of Bob may be given to The American Friends of the Episcopal Diocese of Jerusalem, www.afedj.org.